Vitamin D: A Supplement for All Seasons? No longer just a cold & flu remedy! Diabetes: Facts & Figures from the Epidemic With an information sheet on the key supplements that have been studied for diabetes/insulin resistance. Blog on! Intriguing report on our blog readers’ most-used search terms. 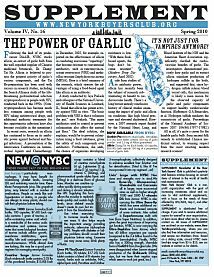 The Power of Garlic Quite a career for the humble garlic bulb: from folk remedy, to Chinese medicinal herb, to a 2006 NIH/American Heart Association reseach study of its effect on cardiovascular function! NEW @ NYBC A roundup of new botanicals and other supplements now available from NYBC–and why the co-op has chosen to carry them.